handful of days. But this isn't the story of a loss. This is the story of a visit, some warm memories and a recipe. 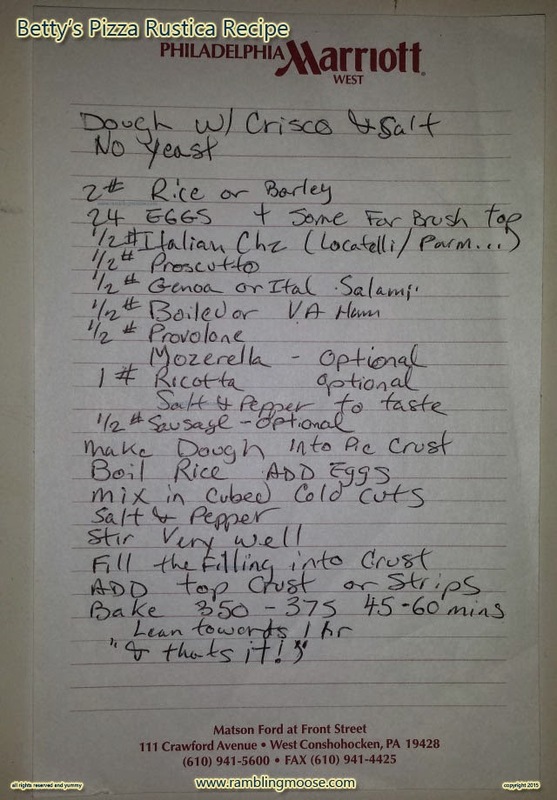 Not really a recipe. It's hard to explain. If you can make a proper Pizza Rustica out of this, I would like some of the leftovers. I intend to try to make this. I promised her I would but we never got really brave enough to try. Now that she's gone, and we know where to get the ingredients here in the Sixth Borough of South Florida, we have no excuses. This started years ago with a different family visit. We would go from our "Wonder Years" house and life in Cherry Hill, New Jersey for a road trip to Woodhaven, Queens, New York City. Up the 295 to the NJ Turnpike, over the Goethals and Verrazano Narrows Bridges to the Belt Parkway. We would eventually be stuck in traffic before we got off that road, then head up Jamaica Avenue to Woodhaven Blvd, to 86th street, near the park and hunt for parking. Or so I remembered. We would be Mom, Dad, my sister, and I. There we would spend a couple days with the extended family. Some bickering would eventually happen but it was all in the family. Some would end up in the living room in front of the TV watching the strange-to-us New York TV channels with their similar but different shows, and the party would be going strong. It never really stopped for sleep, only paused. Food that we learned later to call "Italian Specialties" would be brought out in massive volumes. Lemon Ricotta Pie. Canolis. "The Italian Flag Plate" of Tomato slices with Basil and Mozzarella drizzled with fresh Oregano and Olive Oil from a can that was stored on a narrow shelf to on the stairs to the basement. The oven was running before we finished breakfast and since this memory in particular was a holiday, there were multiple pans cooking early morning. Toward the afternoon there was this savory pie that I remembered fondly and think of to this day. Easter Pie we called it. It was my introduction to some ingredients like Barley and some of that wonderfully sharp "Extra Sharp Provolone" that actually was a little gritty due to its processing that is very difficult to find here in South Florida despite all those New York Transplants we've got rubbing shoulders with us. No wonder why I grew to be a 6'4" man, you just couldn't stay small on all of that food. I was telling this story while sitting on my couch many years later to my Aunt Betty, and how much I appreciated her, the family, and our quirky way of meshing through my childhood. Her youngest daughter, Darlene and I were only a year apart, and she had told me many times how much she liked coming down for the flip side of the coin visit to our wonder years house and wandering around because it was "So Green and Beautiful". It just felt normal to me, where my excitement was walking down to The Avenue, Woodhaven Avenue I think, and exploring those shops and plugging my ears when that loud El train rattled overhead. When I mentioned to Betty that I thought the recipe was lost to the ages, she started talking about the ingredients. I stopped her and said "Maybe we should write this down!". I wanted to make it and I knew that this should get back to everyone some day. While there are many recipes for this pie, this is ours. 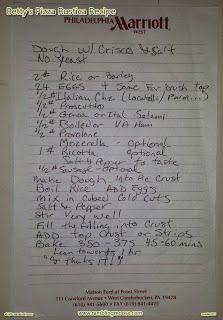 It may be missing ingredients, the crust is pretty incomplete for example, but the list is here complete with my own misspellings and scrawled handwriting. To help find it in the future, the picture above is repeated in text. Dough with Crisco and Salt. Mind you, her ending flourish like anything in an Old Family Recipe misses a few details. How you cook this was in a massive pan by my memory that is about the size of my own roasting pan. It is not a small thing either. Measuring one that is close to my decades old memory is a bit foolhardy but the one I have here for my own roasts is 18x13x3 inches and it does not fit my oven as closely as hers did. Also, adding eggs, two dozen of them to the rice or barley? Better make sure they have cooled down "some" or else the heat from the cooked grains will cook the eggs for you before they even get mixed in fully. She would layer that crust inside the pan, then pour the filling in and cover it up, crimping the sides and poking holes in the top for the steam to escape. We're talking 6 1/2 pounds of food to go into the recipe before cooking, and the Rice and Barley (I recommend Barley) will soak up more water weight as well. It's going to be a massive pie. If you do make this and run over with extra filling, make a second one. Serve it to your neighbors. Tell them it's "Aunt Betty's Pizza Rustica from Woodhaven, NY! ", make up a story and tell them that everyone up there near the Forest Hill Park knew her and loved her and shared in this pie. Why the story? It's not a story, it's true.